Blood transfusion services (BTS) is responsible for providing right blood component to the right patient at the right time under right conditions. A typical transfusion process in a hospital includes pretransfusion compatibility testing by blood bank followed by the transportation of red blood cell (RBC) unit, usually through a human courier; to patient bedside for transfusion. However, as soon as any blood unit leaves the blood bank premises, blood bank has limited control over cold-chain maintenance and traceability. The authors' center is primarily a surgery-oriented hospital and since blood center is located at a distance from operation theaters, anesthetists procure certain number of blood units in advance for all patients undergoing elective or emergency for “just-in-case” scenarios. This often results in overordering, nonusage of few units, and their discarding. Even after the implementation of minimum surgical blood ordering schedule (MS-BOS), the authors' blood center continued to discard unused blood units returned from operation theater due to the disruption of the cold chain. In an effort to reduce this preventable wastage, an “intervention” from transfusion medicine team was undertaken in collaboration with the liver transplant team since liver transplantation is a major surgery and requires multiple number of blood components in the recipient, and sometimes, this requirement can be unpredictable. The intervention entailed the transportation of precrossmatched compatible RBC units for storage in temperature-controlled refrigerator just outside the operation theater. This intervention was done with the help of an electronically controlled remote inventory and bedside transfusion management system called BloodTrack Courier. The effectiveness of BloodTrack Courier in tracing and reducing red cell unit wastage was studied over a 4-month period and compared with a 4-month historical control. This study was conducted by the department of transfusion medicine in coordination with the liver transplant team at a tertiary health center in North India. This was a prospective pilot study conducted over 4-month period (April to July 2016), and the study data were compared with similar transfusion data from previous 4 months (December 2015 to March 2016). The intervention was limited to RBC units issued in elective living-donor liver transplantation (LDLT) cases through the BloodTrack Courier software. This was located in the in-house IT department and was responsible for the intranet link between the “manager” software installed on the personal computer desktop at the blood bank and the “courier” kiosk connected to RBC refrigerator (R1) placed outside the liver transplant operation theater complex. The software was installed on a personal computer desktop at blood bank. The software enabled the transfusion medicine staff to allocate crossmatched compatible RBC units to intended patient. Unique Hospital Identification number, patients', and donor-units' blood group were entered in the software at the time of unit allocation. Allocated RBC units were then physically transferred to a standard 2°C–8°C blood bank refrigerator (R1; Helmer Scientific, Germany) located inside the liver transplant operation theater complex. The kiosk was connected to the refrigerator (R1) located inside the liver transplant operation theater complex. Access control was provided to doctors from transfusion medicine team and liver transplant anesthetists through hospital identity cards with different access levels. Blood component requisition form was received at blood bank 1 day before an elective LDLT. 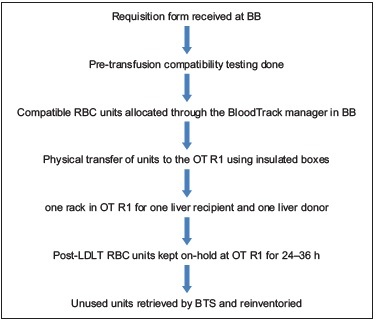 Pretransfusion compatibility testing was carried out; compatible RBC units were first allocated through the BloodTrack manager in the blood bank and then physically transferred to the OT refrigerator (R1) using insulated boxes. At any given point of time, one rack in the OT refrigerator contained RBC units for one LDLT only, that is, one liver recipient and one liver donor. Post-LDLT preallocated RBC units were kept on hold at the OT refrigerator for a period of 24–36 h, after which the unused units were retrieved by the BTS and reinventoried [Figure 1]: Study protocol]. Labeled compatible blood units for both recipient and donor were transported to the R1 using insulated boxes making sure that cold chain was maintained throughout the transportation. A standard 2–8°C blood bank refrigerator was placed outside the liver OT complex. Access to R1 was through the kiosk connected to the refrigerator. Electronic access control was through the hospital identification (ID) card (an electronic chip embedded in it) and was password controlled. Access was granted to doctors from transfusion medicine and liver transplant anesthetist team. To retrieve an RBC unit, accessor had to scan the ID card and enter the password. This would open the refrigerator door. RBC unit was selected and then scanned for identification before retrieval. This maintained traceability at all times. Data collection involved number of transplant procedures, RBC units stored, transfused, and retrieved from the BloodTrack. The “t-test” was applied to compare the RBC unit's wastage before and after the intervention. The study was approved by the Institutional Ethics Committee, Medanta Institutional Ethics Committee. Transfusion of RBC units in 60 liver transplant recipient donors before installation was compared with similar 86 liver transplant recipient donors after installation of BloodTrack. Mean number of RBC units transfused in recipient donor decreased from 6.2 and 1.0 units before installation to 5.9 and 0.76 units after installation, respectively. RBC units discarded due to breakage of cold chain reduced from 284 RBC units to zero and RBC units successfully returned to blood bank increased 7.6 times from 80 to 611 RBC units. The comparison in reduction in number of discarded units and number of returned RBC units, both in recipients and donors, in pre- and post-installation period of BloodTrack was statistically significant (P < 0.005). 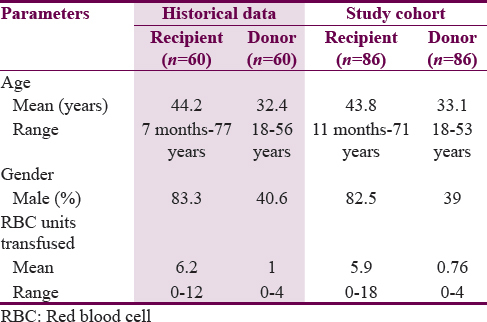 [Table 1] and [Table 2] depict demographic details of recipient donor and RBC units allocated, respectively. Implementation and use of blood inventory management and remote issue software of BloodTrack system was highly successful. As clearly evident by the results, a significant number of RBC units were successfully returned to the blood bank instead of being discarded. The intervention saved around 611 RBC units during the study period. This converts to approximately INR 19.5 lakh or $28.7k (this works out to be INR 58.5 lakhs [$86.2K] per annum). Apart from the financial savings, unnecessary transfusions were possibly prevented (data not provided). The anesthetists tend to overprocure RBC units for “just-in-case” scenarios and would end up transfusing such units. The BloodTrack system prevents such transfusions by providing RBC units “just-in-time” and thus reduces cost (of unnecessary transfusions) and improves patient safety. Number of intraoperative RBC transfusion is an independent risk factor for hepatic artery thrombosis, thus reduction in number of such transfusions also improves patient safety. Reduced number of transfusions also reduces the possible risk of immunological reactions and transfusion-transmitted infections. This is also echoed by Davies et al. in their discussion “significant savings in blood use might realize sufficient cost savings to allow the implementation of electronically controlled blood transfusion procedures in hospitals with the prime aim of improving patient safety.” They used BloodTrack system for storage and retrieval of RBC units. There were a few challenges during the course of the study: (1) Rh(D) incompatible units could not be issued through the BloodTrack and (2) personnel withdrew RBC units without scanning at point-of-care leading to disparity in electronic and physical RBC counts. The first challenge came in the form of issuing Rh(D)-positive units to Rh(D)-negative patients (liver recipients), as the present hospital information system (HIS) does not have such a provision. Since HIS and BloodTrack® were interfaced, the challenge can be overcome by upgradation of HIS software. The second challenge was detected when the physical count did not match the BloodTrack counts and was resolved by corrective action in the form of issuing the “missing” units through BloodTrack and conducting retraining of personnel involved. Radio frequency identification (RFID) device can also be used for tracking a blood unit from collection to infusion. It uses small chips with an antenna that communicate over short distances with a transponder. They do not require “line-of-sight” and thus have an advantage over the use of barcodes. It appears that the majority of health-care organizations have been hesitant to adopt RFID technology as part of their inventory management operations because of high start-up and maintenance costs, interoperability issues, and data security standards. Blood inventory management and remote issue functions of BloodTrack are very effective in saving RBC units. Letowska M. Patient-specific component requirements: Right blood, right patient, right time, right place. ISBT Sci Ser 2009;4:52-5. White J. Pre-transfusion testing. ISBT Sci Ser 2009;4:37-44. Pagliaro P, Turdo R, Capuzzo E. Patients' positive identification systems. Blood Transfus 2009;7:313-8. Pandey P, Tiwari AK, Sharma J, Srivastava D, Dixit S, Raina V, et al. Perioperative use of allogenic blood components in live-related donor orthotopic liver transplantation: A cross sectional study. Asian J Transfus Sci 2013;7:68-72. Mahar FK, Moiz B, Khurshid M, Chawla T. Implementation of maximum surgical blood ordering schedule and an improvement in transfusion practices of surgeons subsequent to intervention. Indian J Hematol Blood Transfus 2013;29:129-33. Yang Y, Zhao JC, Yan LN, Ma YK, Huang B, Yuan D, et al. Risk factors associated with early and late HAT after adult liver transplantation. World J Gastroenterol 2014;20:10545-52. Davies A, Staves J, Kay J, Casbard A, Murphy MF. End-to-end electronic control of the hospital transfusion process to increase the safety of blood transfusion: Strengths and weaknesses. Transfusion 2006;46:352-64. Murphy MF, Stanworth SJ, Yazer M. Transfusion practice and safety: Current status and possibilities for improvement. Vox Sang 2011;100:46-59.